For the Costa Rican Olympic shooter, see Carlos Pacheco (sport shooter). For the Brazilian Olympic judoka, see Carlos Pacheco (judoka). Carlos Pacheco (/pəˈtʃɛkoʊ/; born November 14, 1962) is a Spanish comics artist and penciller. He is best known in the United States for his work on titles such as Avengers Forever, X-Men and Green Lantern. Early in his career, Carlos Pacheco did some work for Planeta-DeAgostini Comics, an imprint of pan-European publisher Planeta De Agostini. He primarily drew covers, posters and pin-ups for Spanish translated editions of Marvel Comics, published at the time by Planeta under the imprint called Cómics Forum. His first published superhero comic was an eight-page story titled American Soldier with writer and translator Antonio Moreno, and published as a back-up in Marvel Héroes #41 (May 1991). He later teamed up with writer Rafael Marín to create the characters Iberia Inc. and Tríada Vértice, two groups of Spanish superheroes, that starred in two miniseries published by Planeta-DeAgostini Comics under the imprint called "Línea Laberinto", with plots by Pacheco and Marin, script by Marin and art by Rafa Fonteriz (in Iberia Inc.) and Jesus Merino (in Tríada Vértice). Pacheco first got attention in the United States for his work as penciller on Dark Guard, a four-issue Marvel UK title where he worked with writer Dan Abnett and inker Oscar Jimenez. This led to him being offered work by American comic editors leading to Marvel Comics' 1994 Bishop four issue limited series where he worked with writer John Ostrander and inker Cam Smith. Later that year Pacheco did his first work for DC Comics on The Flash #93–94 and #99, with writer Mark Waid and inker Jose Marzan Jr..
After that Pacheco's next stateside work came in 1995's X-Universe two-part limited series (a part of the "Age of Apocalypse" storyline), published by Marvel. Pacheco was joined by writer Terry Kavanagh and was again inked by Cam Smith. At the end of 1995 and the beginning of 1996 Pacheco and Smith collaborated with writer Warren Ellis on a Starjammers limited series. This series was successful enough that the creative team was reunited on Marvel's Excalibur ongoing series for a brief run in 1996. Shortly after this Pacheco became penciller on Marvel's Fantastic Four for two issues (#415–416), where he worked with writer Tom DeFalco as the title wrapped up in preparation for the "Heroes Reborn" storyline. By that point Pacheco's art had become a fan favorite, with his work regularly getting coverage in magazines such as Wizard. In early 1997 Marvel acknowledged this by assigning Pacheco to one of its flagship titles, X-Men, with #62 (March 1997). On that title he worked with writers Scott Lobdell and Joe Kelly and inker Art Thibert and produce the "Operation: Zero Tolerance" storyline. He left the series at #75 in May 1998. After X-Men, Pacheco began work on Avengers Forever, a 12-issue limited series, where Pacheco worked with writers Kurt Busiek and Roger Stern and for the first time in the U.S. inker Jesus Merino, who from that point on became Pacheco's regular inker. Pacheco's next assignment was in 2000, a four-issue Inhumans limited series, co-written with Rafael Marín with pencils by José Ladrönn and Jorge Lucas. Pacheco wrote, again with co-writer Rafael Marín, a return to the Fantastic Four, with vol. 3 #35. This time he took on the co-writing chores (initially with Rafael Marín, later joined by Jeph Loeb) as well as pencilling duties. Pacheco's pencilling contributions were shorter than expected, with his last art contribution coming in #50, and him leaving the series entirely by #54. His next substantial work after Fantastic Four was for DC Comics: JLA/JSA: Virtue and Vice, with writers David S. Goyer and Geoff Johns. This 96-page graphic novel united the Justice League and the Justice Society against common foes in the style of what once had been an annual tradition. In 2003 Pacheco reunited with his Avengers Forever collaborator Kurt Busiek for the creator-owned fantasy war series Arrowsmith, published by WildStorm. This series envisioned a world where magic is real and the First World War was fought with dragons, spells, vampires and others used as weapons by both sides. The series ran for six issues and there are plans for future series set in that world which would again be written by Busiek and drawn by Pacheco and co-plotted by both. Pacheco returned DC Comics to pencil the "Absolute Power" storyline in Superman/Batman #14–18 (Jan.–April 2005), where he was again joined by writer Jeph Loeb. The two told a tale in which, due to the time-traveling machinations of the Legion of Super-Villains, Batman and Superman took over the world and a group of Freedom Fighters has to rise up against them. Later that year at DC, Pacheco shared alternate monthly pencilling duties with Ethan Van Sciver on the new Green Lantern series written by Geoff Johns. 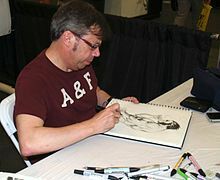 From 2006–2007, Pacheco worked with Kurt Busiek on DC comics' Superman, illustrating issues #654–658, 662–664, and 667. Due to the difficulty of drawing twelve issues a year, the final chapter of the "Camelot Falls" story arc they collaborated on appeared in Superman Annual #13 (January 2008). In 2008, Pacheco produced covers for DC's weekly series Trinity, featuring Batman, Superman and Wonder Woman, and assisted artist J. G. Jones in illustrating the 2008-09 miniseries Final Crisis, on issues #4 to #6. In February 2009, Comic Shop News announced that Pacheco signed an exclusive contract with Marvel. Pacheco's 2009 work included Ultimate Comics: Avengers. Pacheco was one of the artists on the Age of Ultron limited series in 2013 and collaborated with writer Rick Remender on the Captain America series later that year. ^ "Carlos Pacheco". Lambiek Comiclopedia. 2014. Archived from the original on 5 May 2014. ^ Cowsill, Alan "2000s" in Dolan, p. 320: "The fifth series' first story, illustrated by Carlos Pacheco, delved further into the history of the [Green Lantern] Corps." ^ Brady, Matt (16 June 2008). "Carlos Pacheco Joins JG Jones on Final Crisis". Newsarama. Archived from the original on 5 May 2014. ^ Biggers, Cliff; Batty, Ward (February 2009). "untitled". Comic Shop News (1128). ^ Richards, Dave (3 June 2013). "Exclusive: Carlos Pacheco Joins Remender to Nuke Captain America". Comic Book Resources. Archived from the original on 7 June 2013. Wikimedia Commons has media related to Carlos Pacheco.